The diagnosis of Crohn's disease (CD) is a clinical one and can be quite difficult, given that the presenting symptoms can be insidious and non-specific. The diagnosis of CD is made on the basis of symptoms and endoscopic and radiological findings. 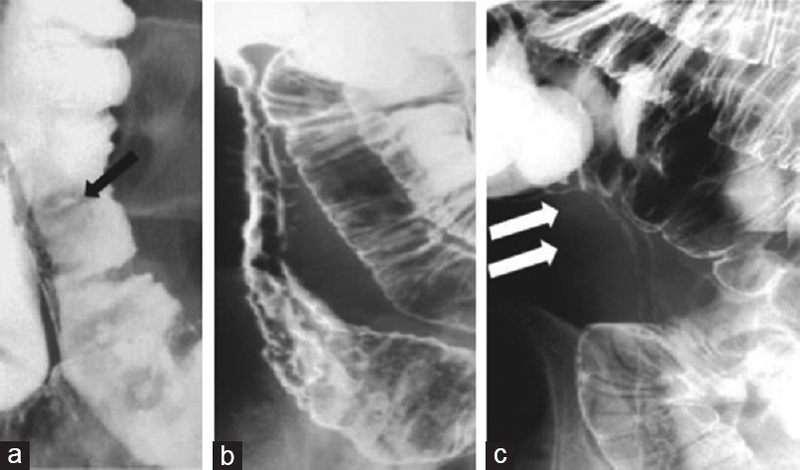 The advantage of a small bowel barium study is that it achieves good mucosal detail, and the distension achieved with enteroclysis is reported to improve visualisation of fistulae, sites of small bowel obstruction and mural or intraluminal filling defects such as small bowel neoplasms. Barium studies have a limited role in the diagnosis of acute small-bowel obstruction or ileus and in the assessment of extraluminal disease, and patients are often referred for additional computed tomography (CT) assessment help characterise small bowel lesions or stage small bowel tumours. In CD, findings of barium studies include stenosis of the ileocaecal valve, luminal narrowing and ulceration of the terminal ileum, irregular thickening and distortion of the valvulae conniventes, mesenteric and mural thickening causing bowel loop separation and loop adhesions resulting in mass effect. Severe CD produces a 'cobblestone' appearance, with deep transverse and longitudinal ulcerations bordered by areas of oedema creating a chequered mucosal relief pattern. Chronic CD leads to circumferential thickening of the bowel wall and can progress to fibrotic strictures, in which irreversible deposition of the extracellular matrix causes impaired peristalsis, fixed luminal narrowing and bowel obstruction [Figure 1]. In patients with inflammatory bowel disease (IBD), ultrasonographic findings are non-specific but can be used to guide further studies and to evaluate the effects of treatment. When peroral techniques are used to distend the bowel, the sensitivity and specificity of ultrasonography in the detection of IBD range from 78% to 90% and from 83% to 95%, respectively. 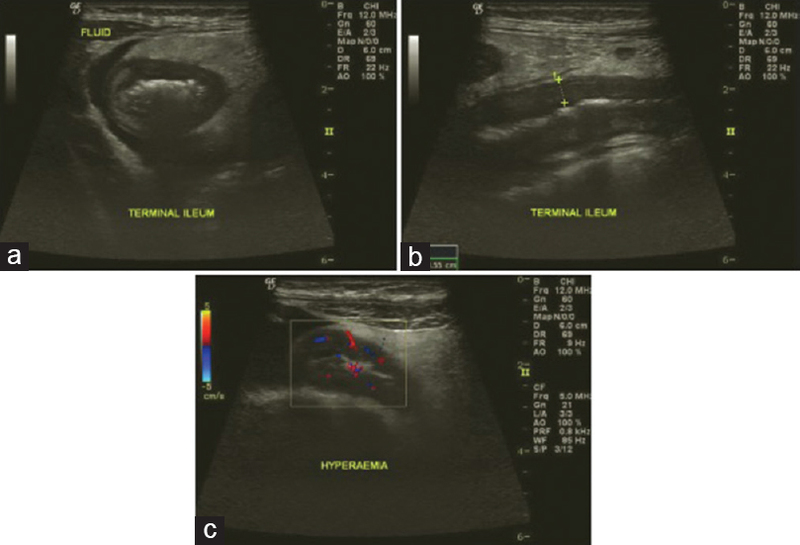 However, ultrasonography is an operator-dependent technique and its use is limited in patients with a large abdomen [Figure 2]. CT has proven to have a very high sensitivity (81%–94%) and specificity (96%) for determining the level and cause of high-grade small-bowel obstruction and is now the investigative method of choice for this indication. The major drawback of CT is patients' exposure to ionising radiation, which has received much attention in recent years given that the IBD population (CD in particular) is likely to require multiple imaging studies over the course of the disease [Figure 3]. The use of fluorodeoxyglucose (FDG) in positron-emission tomography (PET)/CT is the only modality available that allows both functional and morphological visualisation of the whole gastrointestinal tract, as well as detection of extraintestinal areas of inflammation. Improved performance for detecting colon inflammation compared to CT and magnetic resonance (MR) enterography [Figure 4]. With the increasing awareness of radiation exposure, there has been an increased global interest in implementing techniques that either reduce or eliminate radiation exposure, particularly for patients with CD, who are likely to require multiple imaging studies over the course of their disease. MR enteroclysis delineates superficial changes better than MR enterography, and this aspect has to influence the revealing and localising of the disease in patients with only superficial manifestations. Several different pulse sequences are available for imaging the small bowel. The main diagnostic sequences can be divided into the T2-weighted sequences that consist of the half-Fourier acquisition single-shot turbo spin-echo imaging (HASTE) techniques (single-shot fast spin echo [SSFSE], HASTE and single-shot turbo spin echo) and the balanced gradient echo (fast imaging employing steady-state acquisition, true fast imaging with steady-state precession, balanced fast field echo and balanced steady-state free precession) sequences. Contrast-enhanced T1-weighted sequences are obtained using a gradient echo technique with fat saturation. The most commonly used sequence in small bowel imaging is fast low-angle shot using both two-dimensional (2D) and three-dimensional (3D) acquisitions. These are routinely used to identify increased enhancement in an inflamed bowel wall [Figure 5]. T2-weighted sequences are generated by rapid acquisition and relaxation enhancement with ultrafast acquisition time. They are known as half-acquisition SSFSE or SSFSE sequences, depending on the manufacturer. They are heavily T2-weighted sequences, complementary to gadolinium-enhanced gradient echo sequences, and produce a high contrast between the lumen and the bowel wall. As these sequences are highly resistant to magnetic susceptibility or chemical shift artefacts, the wall thickness may be evaluated accurately. Moreover, the sinus tracts and fistulas are well visualised. These sequences are sensitive to intraluminal motion and there may be intraluminal low-intensity signal artefacts. Balanced steady-state free precession sequences are characterised by two unique features as follows: (1) a very high signal-to-noise ratio and (2) a T2/T1-weighted image contrast. The recent development of faster pulse sequences provides an opportunity to create a film of cine images. Cine imaging confers the ability to observe the motion of intestinal segments over a relatively short period and in real time. It provides high temporal, spatial and contrast resolution for monitoring bowel contractions. After intravenous administration of gadolinium-containing contrast material (0.1–0.2 mmol/kg), dynamic coronal 3D T1-weighted gradient echo sequences with fat suppression are obtained at time intervals of 45–55, 70 and 180 s. These intervals are institutionally specific. Delayed axial and coronal post-contrast 2D or 3D T1-weighted sequences with fat suppression are acquired following dynamic imaging. Although rapid transit to the right colon is seen in some patients, most patients require a delay of at least 40–60 min from contrast material ingestion to imaging. Diffusion-weighted imaging (DWI) has long been used in several parts of the body such as the brain. Although the application of DWI to assess the bowel is a relatively new trend, DWI may yield comparable performances for detecting and assessing ileal inflammation in CD. The high signal intensity in DWI and the restricted diffusion of the bowel wall have also has been linked to the detection of acute inflammation [Figure 6]. A successful approach for the radiologist depends on the local availability of services and clinical expertise. Consideration should always be given to new investigative methods with the utility benefit of reduced radiation exposure, single-study techniques or those with increased diagnostic sensitivity. In recent years, MR enterography has become a part of standard diagnostic modality in CD. Novel MRI techniques such as DWI, motility studies, PET-MRI and molecular imaging might further contribute to the diagnosis and management of this chronic inflammatory disease. Cheifetz AS. Management of active Crohn disease. JAMA 2013;309:2150-8. Baumgart DC, Sandborn WJ. Crohn's disease. Lancet 2012;380:1590-605. Masselli G. “Small Bowel Imaging: Clinical Applications of the Different Imaging Modalities—A Comprehensive Review,” ISRN Pathology 2013:13. Article ID 419542. Doi: doi.org/10.1155/2013/419542. Fraser GM, Findlay JM. The double contrast enema in ulcerative and Crohn's colitis. Clin Radiol 1976;27:103-12. Kilcoyne A, Kaplan JL, Gee MS. Inflammatory bowel disease imaging: Current practice and future directions. World J Gastroenterol 2016;22:917-32. Radiopedia. Crohn's Disease: ultrasound Findings. Available from: https://www.radiopaedia.org/cases/crohns-disease-ultrasound-findings-1. [Last accessed on 2017 Aug 09]. Gatta G, Di Grezia G, Di Mizio V, Landolfi C, Mansi L, De Sio I, et al. Crohn's disease imaging: A review. Gastroenterol Res Pract 2012;2012:816920. Radiopedia. Available from: https://www.radiopaedia.org/cases/94123b1dad081f565634ceeb89d3b360/play. [Last accessed on 2017 Aug 09]. Louis E, Ancion G, Colard A, Spote V, Belaiche J, Hustinx R, et al. 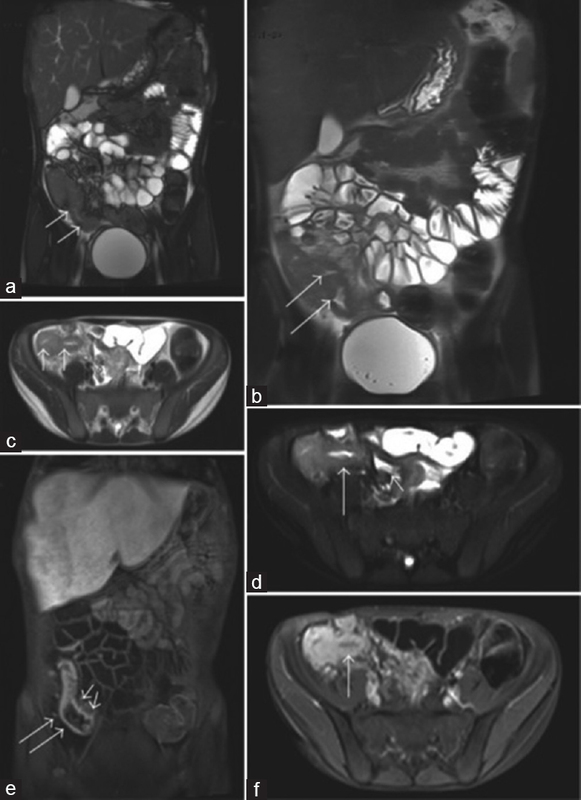 Noninvasive assessment of Crohn's disease intestinal lesions with (18) F-FDG PET/CT. J Nucl Med 2007;48:1053-9. Desmond AN, O'Regan K, Curran C, McWilliams S, Fitzgerald T, Maher MM, et al. Crohn's disease: Factors associated with exposure to high levels of diagnostic radiation. Gut 2008;57:1524-9. Kayhan A, Oommen J, Dahi F, Oto A. Magnetic resonance enterography in Crohn's disease: Standard and advanced techniques. World J Radiol 2010;2:113-21. Siddiki H, Fidler J. MR imaging of the small bowel in Crohn's disease. Eur J Radiol 2009;69:409-17. Rimola J. Bowel imaging. Magn Reson Imaging Clin N Am 2014;22:xiii-xiv. Moy MP, Sauk J, Gee MS. The role of MR enterography in assessing Crohn's disease activity and treatment response. Gastroenterol Res Pract 2016;2016:8168695. Yoon K, Chang KT, Lee HJ. MRI for Crohn's disease: Present and future. Biomed Res Int 2015;2015:786802. Masselli G, Colaiacomo MC, Marcelli G, Bertini L, Casciani E, Laghi F, et al. 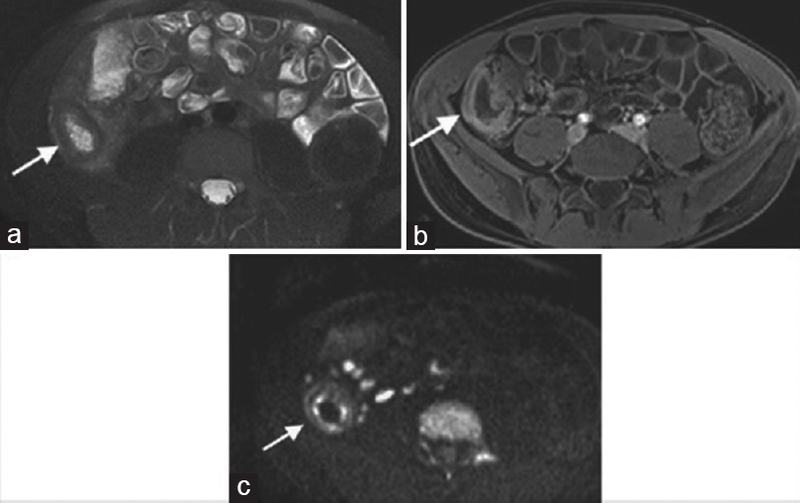 MRI of the small-bowel: How to differentiate primary neoplasms and mimickers. Br J Radiol 2012;85:824-37. Aryan A, Azizi Z, Teimouri A, Ebrahimi Daryani N, Aletaha N, Jahanbakhsh A, et al. The diagnostic role of magnetic resonance enterography as a complementary test to colonoscopy in active Crohn's disease. Middle East J Dig Dis 2016;8:93-101. Courtier J, Ohliger M, Rhee SJ, Terreblanche O, Heyman MB, MacKenzie JD, et al. Shooting a moving target: Use of real-time cine magnetic resonance imaging in assessment of the small bowel. J Pediatr Gastroenterol Nutr 2013;57:426-31. Tolan DJ, Greenhalgh R, Zealley IA, Halligan S, Taylor SA. MR enterographic manifestations of small bowel Crohn disease. Radiographics 2010;30:367-84. Wakamiya M, Furukawa A, Kanasaki S, Murata K. Assessment of small bowel motility function with cine-MRI using balanced steady-state free precession sequence. J Magn Reson Imaging 2011;33:1235-40. Buisson A, Joubert A, Montoriol PF, Da Ines D, Hordonneau C, Pereira B, et al. Diffusion-weighted magnetic resonance imaging for detecting and assessing ileal inflammation in Crohn's disease. Aliment Pharmacol Ther 2013;37:537-45. Fletcher JG, Fidler JL, Bruining DH, Huprich JE. New concepts in intestinal imaging for inflammatory bowel diseases. Gastroenterology 2011;140:1795-806. Chavhan GB, Babyn PS, Walters T. MR enterography in children: Principles, technique, and clinical applications. Indian J Radiol Imaging 2013;23:173-8.